This workshop is suitable for photographers and visual artists of all skill levels, from hobbyist to professional. A fully developed project, although advantageous, is also not necessary to take part in this workshop and a photobook may be created from a series of images based around a specific theme. The most important element of this workshop is of course your images. We will print your work prints in advance the workshop, which we will ask you send to us prior to the workshop. Low resolution jpegs will be sufficient for this. Be sure to also have your high resolution digital image files with you on a hard drive or laptop with you on attendance of the workshop. Do I need a laptop or any particular software? If you have a laptop, please bring it along with your hard drive containing high resolution copies of your images. These can be in Jpeg or Tiff format. Let us know in advance if you have Adobe InDesign. If not, a trial version is available to download from the Adobe website, which should be done in the days leading up to the workshop. If neither of these options are available, we will make sure there is a computer with Indesign for you to work off of. Do I need to know Indesign or any other software? While a background in Indesign is advantageous, it is not strictly necessary. We will give you a basic guide to using Indesign, which will get you well on your way to designing your dummy. We will also be on hand to answer any and all questions. Is there anything else I should bring along? We will be providing all printing and binding materials, however you are welcome to bring along any additional items you think could be pertinent to the development of your dummy. This could be a previous book you have made, a photobook you find interesting or any materials you would like to use in the production of your dummy. A non-refundable deposit is needed to secure your place on the workshop. The remainder of the workshop fee is then to be paid in the week leading up to the workshop. This can be done via bank transfer prior to the workshop, or with cash or card on the first day of the workshop. Make a Photobook is a three-day group workshop lead by the Read That Image team and guest tutors. Workshop participants will explore each stage of the bookmaking process and create their own photobook dummies. 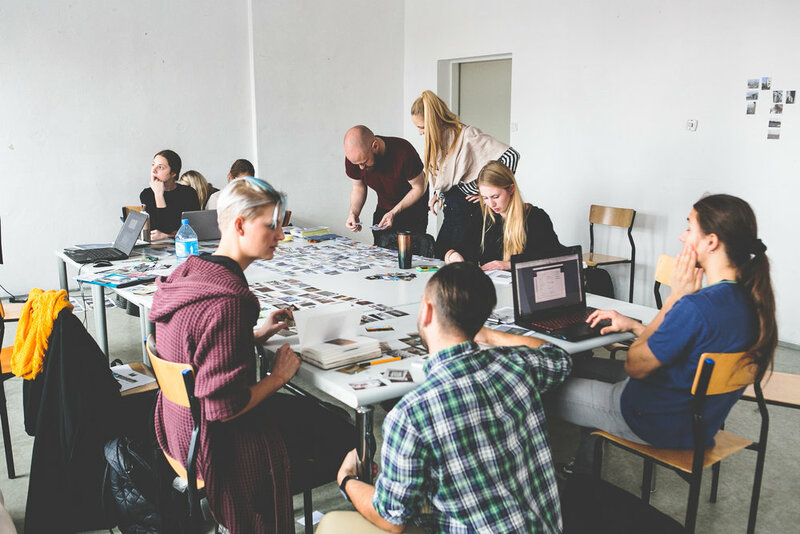 During the workshop participants will learn the language of the book form, how to read images, make meaningful decisions and build a book that is rooted in a carefully considered concept. Participants will work collectively and individually on their books with guidance from the RTI team throughout each stage of the bookmaking process. The workshop format is intense, fast-paced, hands-on and highly productive. Participants will arrive with a collection of images and leave with a hand-crafted dummy book, and the knowledge and understanding required to develop it into a fully-fledged photobook. To submit please send a selection of images and project description via the submission form. For additional information please contact the Read That Image team. Please note the workshop fee covers the cost of all materials including work prints, printing one dummy book per participant, and all binding materials.